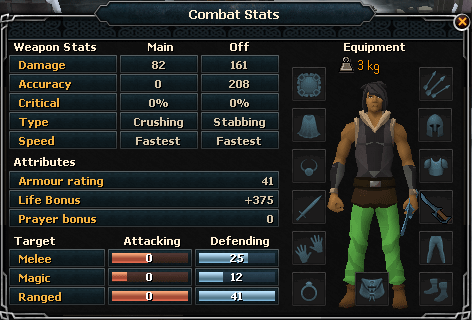 The Warriors' Guild is a members-only guild made specifically for players who are skilled in the area of melee combat. It boasts a wide range of activities and is home to the Cyclopes whom drop the elusive Defenders. 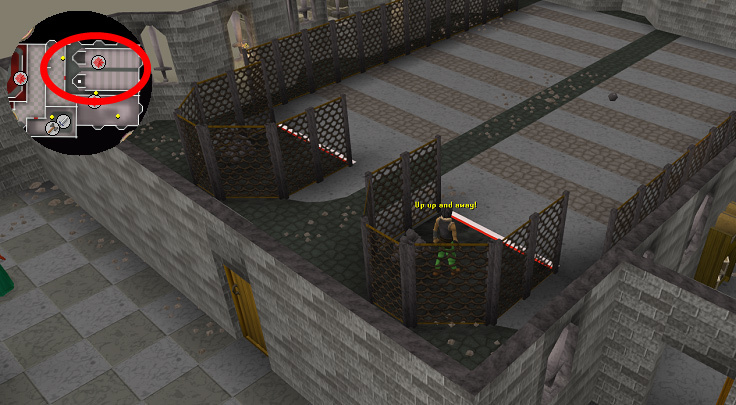 It is located to the west of Burthorpe and requires a minimum of 130 total level when you combine both your Attack and Strength levels (e.g having an Attack level of 60 with a Strength level of 75 will give you a combined level of 135 which allows you entry into the Warriors' Guild). 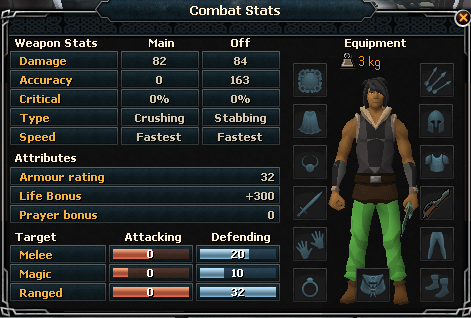 Alternatively, you can have a level of 99 in Attack and still gain entry into the Warriors' Guild no matter what your Strength level is, and vice versa. There are no quest requirements for entry into the guild. Temporary Stat Boosters may not be used to gain access to this guild. The Warriors' Guild is a highly popular guild as it contains a variety of activities and also hosts Cyclopes. Participating in each activity will earn you tokens which are known as 'Warrior Guild Tokens'. The amount of tokens gained varies from each activity as some activities are more difficult than others. These tokens are used to gain entry into the room which holds the Cyclopes. The Guild also features various shops and is home to Ajjat, from whom you can buy an Attack skill cape once you've reached 99 Attack, and Sloanne, from whom you can buy a Strength skill cape once you've reached 99 Strength. 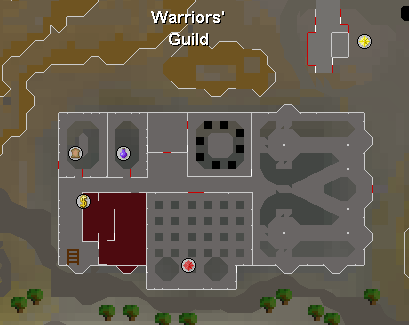 Warning: The Warriors' Guild is not a safe area! If you die during any of the activities, you will lose your items as you would if you died anywhere else in the game! 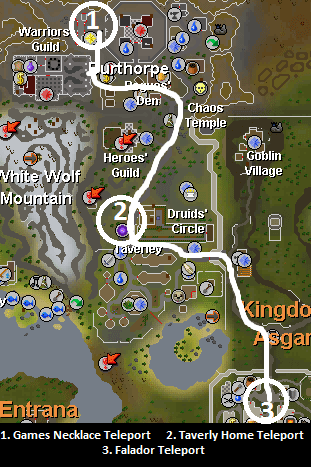 There are three simple ways of travelling to the Warriors' Guild. 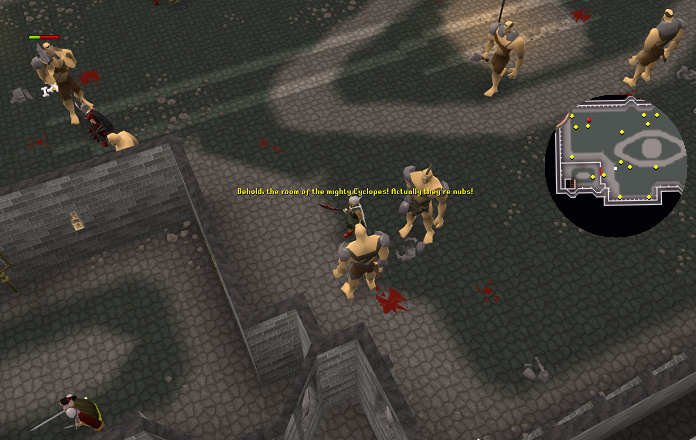 Teleport to the Burthorpe Troll Invasion via the Games Necklace, then walk a short distance south to enter the guild. This option is ideal as it takes less than 10 seconds. If your Player owned House is located in Taverley, simply teleport to your house then walk to the guild. This option takes no more than 2 minutes. 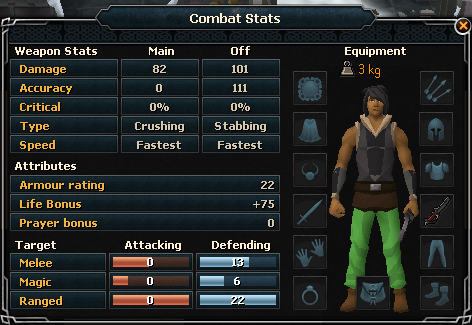 Teleport to Falador, then walk for some distance to Burthorpe in order to arrive at the guild. This option takes approximately 3 - 4 minutes. In total there are 5 activities that you can participate in and earn Warriors' Guild Tokens from. There are 2 activities on the ground floor, and a further 3 activities on the 2nd floor. Before we get started on these activities, let's review the token system. 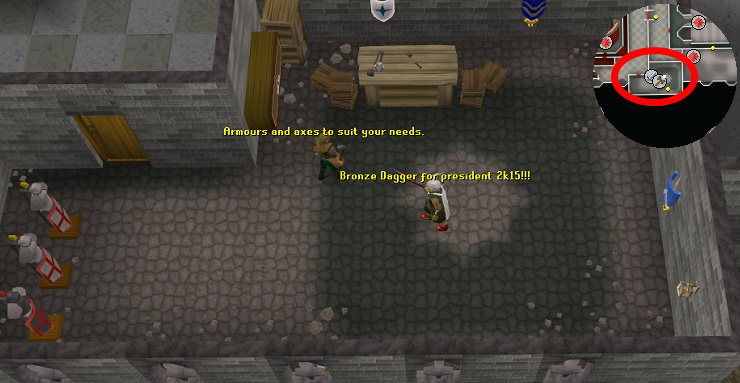 Before the 2009 update which introduced Dragon Defenders, Warrior Guild Tokens were actual items that were claimed from various Warriors' Guild Masters or picked up as a drop from killing Animated Armour. Now, it has changed into more of a "points system" where tokens are received by adding them to a 'Token Count' that appears on the left side of your screen whenever you're in the Warriors' Guild. Each image is unique to it's activity. 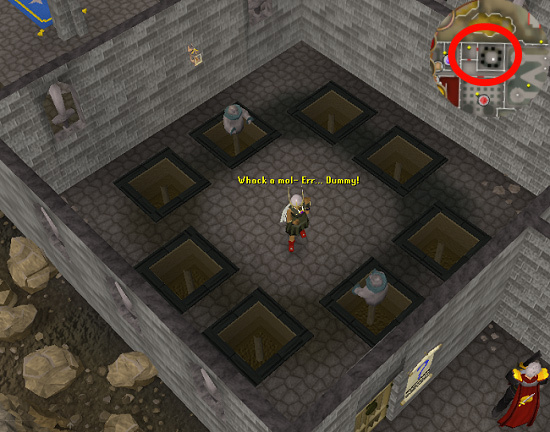 The first activity you will see upon entering the Warriors' Guild is 'The Dummy Room'. It is located on the first floor and on the right side of the Guild upon entering. It contains a square room with 8 trapdoors and 7 different types of the dummy. When a player enters the room, a dummy rises from the trapdoor and the player must hit the dummy. 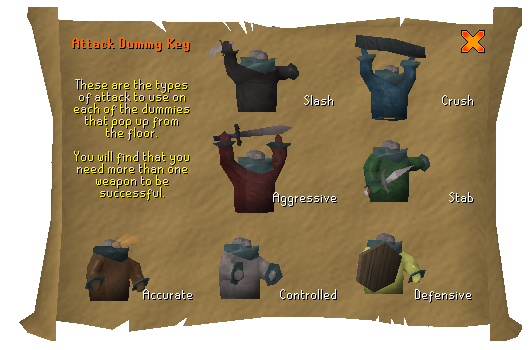 The only way to successfully hit the dummy and earn your tokens/experience is by using the correct attack style on the dummy. If you hit the dummy using an incorrect attack style, you will be momentarily stunned although no damage will be taken. For example, if a yellow dummy holding a shield appears, the player must use the 'Defensive' attack style in order to successfully hit it. Refer to the dummy key below and be sure to memorise it to swiftly hit each dummy. The dummy key can also be found inside the dummy room on the wall. In order to be able to successfully hit each dummy more than 1 weapon is needed. For this, it is recommended that a player brings in both a battleaxe and a mace in order to cover all attack styles. If you do not have these weapons, they are easily purchasable from the Armoury on the 2nd floor. Upon successfully hitting a dummy the player will receive 15 experience in the attack style they used and 5 tokens. The dummies remain standing for 5 seconds so if a player successfully hits all dummies within a minute they will earn 60 tokens per minute. This activity does not provide the most tokens per minute but since you cannot die in this activity it is still a good method for collecting tokens. The tokens earned in this count towards your 'Attack Tokens'. The second activity that is on the 1st floor is 'The Animation Room'. It is located on the left side of the Guild upon entering, right next to the Dummy Room. It contains a square room that contains 2 'Magical Animator' machines which bring your armour to life! To begin simply place a set of armour onto the machine, the set includes: Platelegs, Platebody and a Full helm. 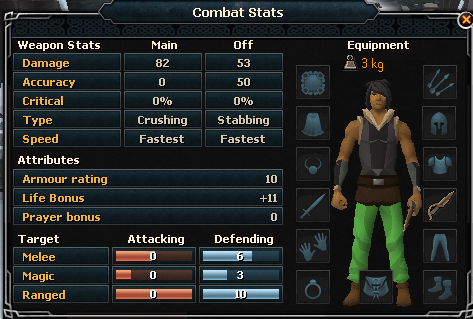 They must all be of the same metal (no mixing and/or trimmed/special armours), Dragon and Barrows armour do NOT work on the machine. When a player places the armour onto these machines it animates the armour and brings it to life. Watch out though, your animated armour will try to kill you! 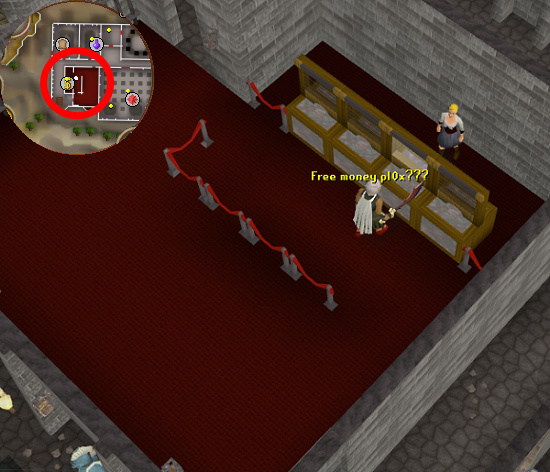 The way to earn tokens in here is to kill your animated armour. The better the metal you place on the machine, the stronger your enemy will be and therefore the more tokens you will earn for defeating it. Look below to see what levels the animated armour are and how many tokens you earn. This activity is regarded as the best way to earn tokens by higher levelled players as one can quickly kill 2 animated Adamant Animated Armours within a minute earning over 100 tokens. 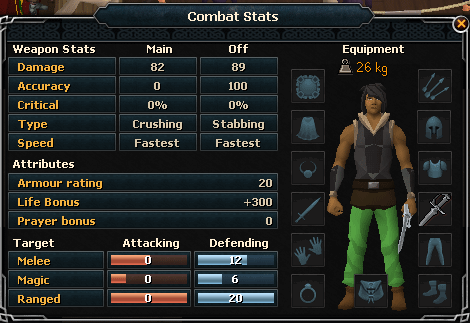 It is also much more AFK-able and doesn't involve as much clicking as the dummy room. Remember, these animated armours can deal a lot of damage so be sure to bring a decent set of armour for yourself with good food - at least Lobsters or higher - and constantly check your health. The tokens earned in this activity count towards your 'Combat Tokens'. Take note, upon defeating your armour the pieces will drop on the ground, so remember to pick them up. As well as that, one (or more) of your items may become damaged therefore you will lose that piece of item. The stronger the armour is, the less chance of you losing it (e.g., Bronze armour has a higher chance of breaking than Iron armour etc.). The third activity you will find is 'The Catapult Room'. It is located on the second floor, directly north of the stairs. It features a room with a huge catapult on one side, with a target sign on the floor opposite it. Before you enter this room, you must grab a shield off of Gamfred just outside the room. He will give you a two-handed shield which is only able to be equipped inside the catapult room. Once you have entered the room equip the shield and go stand on the elevated spot to begin. It takes 5 seconds for the projectile to hit you, giving you a huge reaction time making this activity the easiest of them all. If you successfully defend against a projectile, you will earn 4 tokens and 10 Defence experience. Be warned though, if you fail and get hit you can be hurt by up to 40 life points! Also, you cannot access your inventory during this activity therefore you won't be able to eat food and restore life points. The projectile takes 5 seconds to hit you, so that gives 12 projectiles in a minute. If you successfully defend all 12 projectiles you will earn 48 tokens per minute. 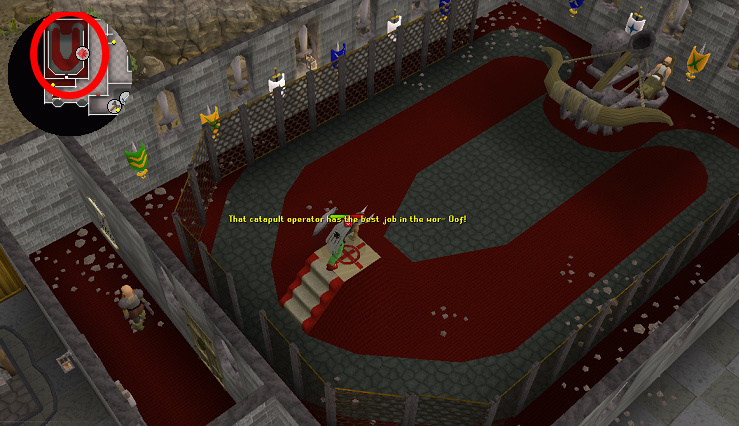 This is 12 tokens less than the dummy room, and gives almost the equivalent of defeating a Mithril Animated Armour. 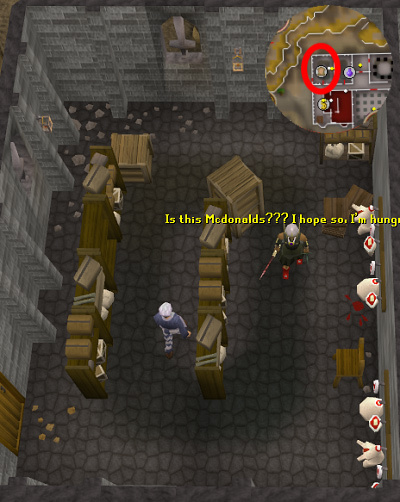 The low rate of tokens per minute coupled with the fact that it is impossible to AFK, many players view this as the worst activity in the Warriors' Guild. The tokens earned in this activity count towards your 'Defence Tokens'. The fourth activity you will find is called 'The Shot-put Room'. It's a rectangular room that is located east of the catapult room. It features a large room with 2 cages at the start and within those cages lie a pile of shot puts - 18lbs and 22lbs shots. The field where you throw your shots is 13 yards long. To begin, simply click on a pile of shots, choose an option - standing throw, stepping throw and spinning throw - and throw the shot. The further your ball goes, the more Strength experience and tokens you will receive. It is recommended that you throw using the spinning option, as this gives you a much stronger throw. Watch out though, as you can occasionally drop the ball on your foot and lose 10 life points. To decrease the chance of dropping your shot, grind up some ashes with a pestle and mortar to get 'Ground Ashes' then dust your hands with them. This will dramatically reduce the frequency of dropping the shot. The tokens earned in this count towards your 'Strength Tokens'. The final activity is called 'Jimmy's Challenge Room' but is also known as 'The Keg Balance' activity. It is located south of the shot-put room. It features a small room with various kegs scattered around, and contains various random objects. To begin, remove all head wear, weapons and gloves, then pick up a barrel. Once you have a barrel on your head, you will begin earning experience and tokens. The more barrels you have on your head, the more tokens you will earn plus the more Strength experience you will earn. The maximum amount of barrels you can have on your head is 5. You will earn your tokens when you have dropped the barrels. Every 7 seconds you will also lose 9 energy whilst gaining Strength experience. The chance of dropping the barrels increases as your energy decreases, therefore it is recommended you bring energy restoring items such as Energy potions and the Explorer's Ring. Another great way of keeping your energy up is by using the Salt-Water Spring that is located in the city of Oo'Glog. To use the facility, a player must complete As a First Resort. Upon entering the spring, a player will receive unlimited run energy for a certain amount of time depending on their Agility level. When you do drop the barrels, you will be dealt up to 40 life points of damage. In addition to that, you can tag the 5 objects around the room in the order that is displayed at the top of your screen. Upon doing this, you will earn additional Strength experience. This activity is regarded as another great way for earning tokens, and if you're lucky can provide huge Strength experience boosts. It certainly is the best token gain per minute for lower levelled players who don't dare take on Adamant or Rune Animated Armour but for higher levelled players either one would suffice. It certainly does have a good AFK factor to it as once you've picked up all 5 barrels you don't have to do anything unless you want to tag all the items. The tokens earned in this count towards your 'Balance Tokens'. The first shop you will find is Lilly's Apothecary (Warriors' Guild Potion Store). It is located north-west, to the left of the dummy room on the ground floor. Lilly only sells 3 potions: Strength Potion (3) which she sells for 1200 coins, Attack Potions (3) which she sells for 560 coins and Defence Potions (3) which she sells for 880 coins. Unfortunately, buying the potions in this shop and then selling them on the Grand Exchange does not turn a profit, although these potions can provide great help in defeating Animated Armour or Cyclopes faster. The second shop you will find is Lidio's Food Shop (Warriors' Guild Food Shop). It is located directly to the west, just north of the bank on the ground floor. Lidio sells a variety of foods which include: Trout which he sells for 68 coins, Bass which he sells for 270 coins, Plain Pizza which he sells for 200 coins, Potato with Cheese which he sells for 350 coins and Stew which he sells for 100 coins (all of the foods are cooked). It IS possible to make money by buying the Plain Pizza's here. You can buy the Plain Pizza's here for 200 coins, and then potentially sell them for around 400 coins, which gives a profit of 200 per Plain Pizza. Although, since you can only buy 10 Plain Pizza's at a time, and then have to wait a while for the supply to come back, it makes this method very slow and inefficient. This shop doesn't provide the best of foods but it certainly does help if you need some quick, cheap food to take with you into the activities. The third shop (not necessarily a store) is Jades' Bank. It is located south of the food shop, and just east of the stairs. Jade is the only banker and offers a full access-bank where you have access to the collection box and your bank account. The fourth and final shop is Anton's Armoury (Warriors' Guild Armoury). It is located on the 2nd floor directly east of the stairs. Anton sells a range of low levelled weapons and armour which include: Battleaxes (Iron - Mithril), Swords (Bronze - Adamant), Longswords (Bronze - Adamant), Daggers (Bronze - Adamant), Maces (Bronze - Adamant), 2h Swords(Bronze - Adamant), Chainbodies (Bronze - Steel) and Med Helms (Bronze - Steel). The only real use for this shop is to buy a Mace and Battleaxe, which is very useful for the dummy room, and for selling weapons dropped by Cyclopes. Defenders. A great choice for the shield slot. Defenders are weapons that are wielded as a shield and give attack bonuses and also some defence bonuses. To wield a defender a player must have an Attack level high enough to wear an item of that metal, along with a Defence level high enough to wear that metal (so in order to wield an Adamant Defender a player MUST have at least 30 Attack and at least 30 Defence). There are in total 8 Defenders, 1 for each tier of metal (Bronze through to Dragon). Head on up to the third floor where you will find Kamfreena and click on the door. Kamfreena will know that you have not earned a Defender yet, so she will make the Cyclopes drop a Bronze Defender. You will be given an option to use single token mode or multi-token mode. Select one and you will enter the room. Inside the room players will find 2 types of Cyclopes: Level 56 Cyclopes and Level 76 Cyclopes. The two can be distinguished via their hair, the level 76 Cyclopes have hair whilst the level 56 Cyclopes don't. These Cyclopes will always drop big bones, and may also drop various weapons (up to Adamant, which can be sold to Anton) and often black knives. They do drop Defenders, although it is only chance. Some people get a Defender drop within 5 minutes, some get it after a few hours. 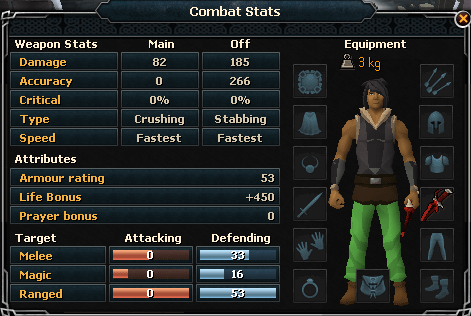 It is worthwhile to know that the Ring of Wealth does not increase your chances of a Cyclops dropping a Defender. Occasionally a Cyclossus may spawn. Cyclossus is the boss of Cyclopes, he is level 156 and can only be damaged by players wielding a Rune or Dragon Defender. 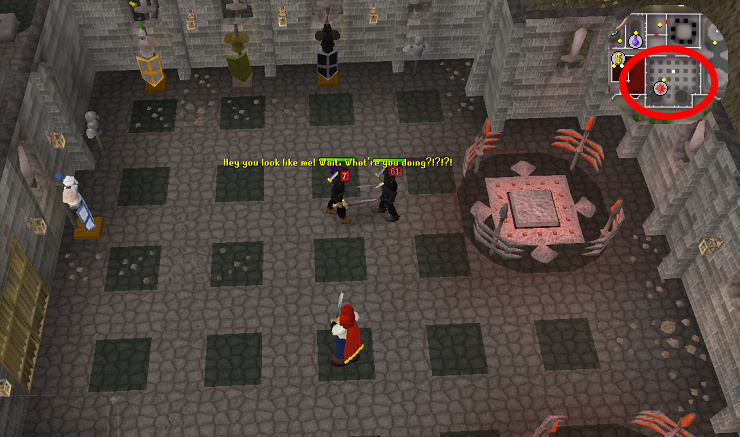 He gets spawned when someone with a Rune or Dragon Defender kills Cyclopes (random chance of him spawning) and he starts attacking that player. Only the player whom the Cyclossus starts attacking can attack him back but if said player runs away or doesn't fight the Cyclossus, he will start wandering around the room taunting. During this time anyone can attack him. Cyclossus has much more valuable drops and also has a Dragon Defender has a common drop which makes him a popular monster to kill for getting one. Every minute Kamfreena will deduct 20 tokens (from the token option you chose at the beginning) if you went with single token mode, or 3 of each token if you went with multi-token mode. Kamfreena will inform you that in a minute you will run out of tokens, therefore you should leave the room. If players do not heed this message they will be teleported out of the room as soon as they use up their token's. Once a player has earned a Defender, they must exit the room and use their defender on Kamfreena. She will see you have earned a Defender and will make the Cyclopes drop the next tier. Note: If a player does not leave the room and talk to Kamfreena upon receiving a Defender, the Cyclopes will simply keep dropping the same tier. A player does not have to wield the Defender they just received in order to receive the next tier, they only have to show the Defender to Kamfreena before entering the room. Always keep the previous Defender you received. This way, if you lose your best Defender you won't have to start from Bronze again. Alternatively, if you have a Dragon Defender you can simply get multiple Dragon Defenders. 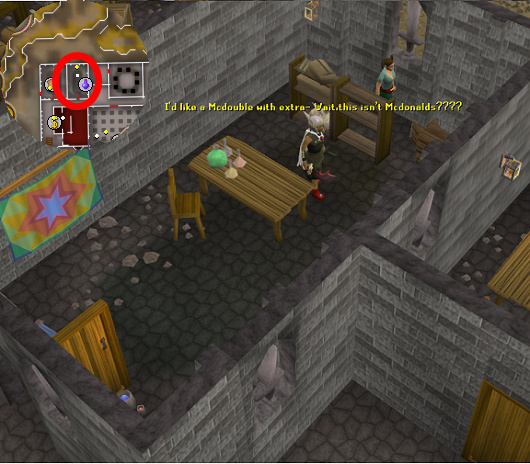 To do this, show your Dragon Defender to Kamfreena and enter the room, she will make the Cyclopes drop Dragon Defenders. Always remember to show your current Defender to Kamfreena before entering the room or after you've picked one up. If you wish to obtain multiple Rune Defenders (or any other Defenders) simply show a Defender that's one tier down from the one you want (so if you want multiple Rune Defenders simply show her an Adamant Defender). 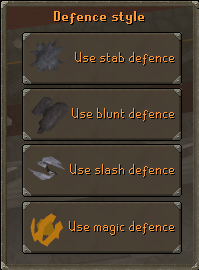 Remember to keep every Defender you've received in your bank for later use, you never know when you're going to need it. That's about it. Thanks for reading and good luck in getting those Defenders, they are definitely worth it!